In the sports world, taking your knocks is all a part of the rough and tumble, competitive world. It is very true that only the strong survive. While many professional and amateur athletes alike will become well accustomed or even desensitized to injuries in the course of a game, the often gruesome sight of an ankle injury can turn even the toughest of competitors a little queasy. Common among a variety of sports, ankle injuries are some of the most physically painful and feared. This is especially true in Basketball, where so much demand is placed on the ankles throughout the career of a top baller. It is in basketball where we can see ankle injuries are most prevalent. This can be attributed mainly to the degree of pressure which basketball movements exert on the ankles, especially over a lengthy career, the constant pivots and other sudden foot movements, combined with regular jumping for shots, blocks and rebounds often from awkward angles and under pressure, can spell disaster for the ankles. We need only look as far as a thorough study which indicates that north of 50% of time missed in the sport of basketball is the result of an ankle injury. This high degree of frequency is one of the factors leading sportspeople to be every more protective of their ankles. The ankle is composed of several important structural elements. In fact, it is one of the strongest and most stable joints in the body, and yet, it is still one of the most commonly injured joints. This strength and stability is greatly required as even during regular walking the ankle must withstand a huge amount of bodyweight (up to 8 times body weight during running). The key elements which form the ankle joint are bones, ligaments, muscles, tendons, nerves and blood vessels. The ankle joint itself is formed by the meeting of three bones. The ankle bone is connected to the lower end of the shinbone and fibula inside a socket which they create at their meeting point. The bottom of the ankle bone then rests on the heal bone and the complex joint is complete. In use, the ankle joints works in a hinge fashion inside the socket. This function allows for great stability and movement of your foot to be created. As in other joints, articular cartilage surrounds the bones and allows them to move smoothly against one another. Cartilage is very robust and allows for this attribute to be passed on to the joint in general, though cartilage injuries can occur. The main ligaments in the ankle are the anterior tibiofibular ligament, which horizontally connects the tibia and fibula. This is usually the ligament that is damaged when someone sustains a high ankle sprain. There are also lots of lateral collateral ligaments that connect the fibula to the heel bone. The most important lateral ligament to keep in mind is the anterior talofibular ligament (ATFL). This gives the ankle joint great lateral stability and strength, but even so, sometimes the loads we place on our ankles are simply too much and too fast. The anterior tibiofibular ligament could also be abbreviated with "ATFL", but since the anterior talofibular ligament is much more commonly injured, most clinicians will abbreviate anterior talofibular ligament as ATFL. Let's take the ATFL for example. This ligament is highly stressed when you plantarflex your ankle (point your toes away from you) and invert your foot (turn sole of foot inwards to face opposite leg). This is your classic "rolled ankle" mechanism, and is exactly what the ATFL is trying to resist, which is why it's one of the most commonly injured ankle ligaments. Finally, on the opposite side, the deltoid ligaments connect the tibia to the ankle and heel bones. Injuries to any of these ligaments are way less common, but nevertheless, they can be very difficult and entail a complex period of recovery as in the case of former L.A. Clipper, Glenn Davis. The Achilles tendon attaches the calf muscles to the back the heel bone and is the most important tendon enabling us to walk, run and jump as well as stand on our toes. Injuries to the Achilles tendon can sometimes be career-ending, particularly if it involves a complete rupture. Looking at the most frequent ankle injuries on the court, ankle sprains jumps out as the predominant source of ankle related injury. These can be classed as lateral, medial or high ankle sprains depending on their location on the ankle. In fact, as this study indicates, lateral ankle sprains alone account for a huge number of injuries in basketball. These are the ATFL sprains that we mentioned in the section above. Just this week, NBA megastar LeBron James continues to be sidelined with a troublesome left ankle sprain, highlighting that even some of the greatest players ever are vulnerable to an unforgiving injury. Sprains are common in basketball given the fast movements and frequent foot rolling at awkward angles in basketball, particular during angled drives to the basket or fast pivots to get a shot away or slip guard. This can easily damage ligament fibers and keep an athlete sidelined for months with a high possibility of recurrence. 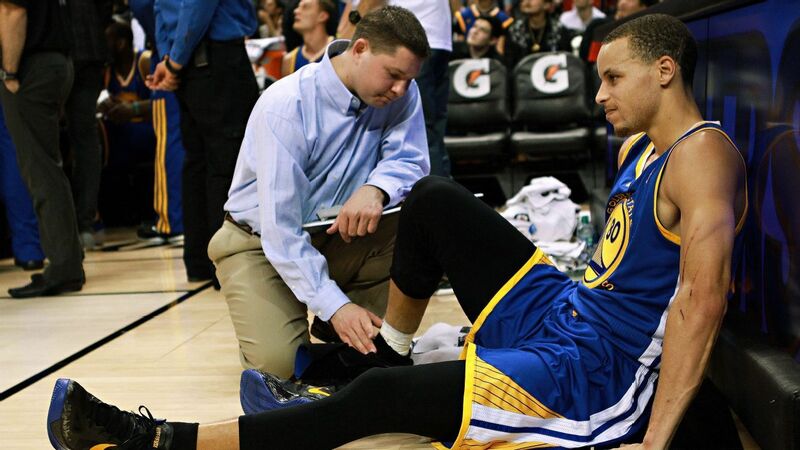 Even we mere mortals can easily fall victim to a nasty ankle sprain. How many times have you suddenly felt your ankle twist beneath you when walking on an uneven surface? This is exactly the type of thing which can lead to a nasty ankle sprain. Another common form of injury due to the constant hard work performed on the court are stress fractures. These can most commonly occur in the fibula, ankle or heel bones and are usually the result of overuse. This research shows that depending on their ability to heal, stress fractures can be divided into both low and high risk categories. A stress fracture in the ankle area can happen quite often even in our daily life, this is especially true if we suddenly increase our level of physical activity which causes pressure, especially on our weight bearing bones in the ankle region. Another common cause of stress fractures is heavy impact, exemplified by the case of soccer player Ryan Wintle who sustained a stress fracture of the tibia after a heavy tackle in a recent match. This would be classified in the high risk category of stress fracture and sideline an athlete for several months. Planter fasciitis is another thorn in the side of NBA and ball players in general. It is so prevalent in the game that it is sometimes referred to as ‘basketball heel’. Plantar fasciitis is most simply, inflammation of the ligament which supports the arch of the foot and also runs the base of the foot. It is most frequently caused through repetitive use. The constant court movement of players is a big factor and indeed the reason why this is a notable cause of injury for a cross-section of athletes in many sports. Among non-athletes, a large contributing factor can be ill-fitting shoes worn over an extended period or a pronounced weight change which adds pressure to the plater fascia ligament. This is an injury which many athletes can successfully attempt to play through. However, this often results in poor performance such as in the case of New York Knicks forward Lance Thomas who suffered the injury in both feet. Proof that injury does not discriminate can be evidenced in the fact that even former U.S. President Barrack Obama, himself a keen basketball player has been afflicted by plantar fasciitis. Treating the selection of ankle related injuries which we have discussed, often will not require surgery depending on the seriousness of the injury. In the case of both ankle sprains and stress fractures, it is likely that you will be asked to follow the R.I.C.E. protocol. The R.I.C.E. protocol is Rest, Ice, Compression, Elevation and this combination of precautions can go a great way to relieving your pain and ensuring the best possible chances of a speedy recovery. This begins with ensuring not to undertake any stressful activities with the injured ankle. Ideally, no activities at all should be engaged in without a very supportive shoe. Applying ice immediately following the injury will assist in reducing any swelling which could occur, remember to use ice packs and not apply directly to the skin however. Compress by lightly enclosing the area in a comfortable bandage and elevate your foot to a level higher than your heart. Further to observing and continuing this process, your doctor may recommend other non-surgical options which can include modifying activities to protect your injured ankle, casting to restrict any movement of the affected area or the application of protective footwear or an ankle brace. Some more serious ankle injuries like high grade stress fractures may require surgical treatment. This is commonly known as internal fixation and involves the placing of screws and plates to hold the bones in place throughout the healing process. It is important after an ankle injury that you follow the correct rehabilitation procedures. A large element of these in the early stages will focus on rest as described above. As you begin to heal though, it can be valuable to engage in some specific stretching to help regain range of motion and flexibility. Sitting with your leg straight in front, point your foot towards you, holding that position for as long as possible. Sitting in the same, straight leg position, now point your foot away from you, again holding for as long as possible. As your recovery continues, you may want to further increase your range of motion by sitting in a straight leg position whilst moving your foot in a circular motion. These are both helpful rehabilitation exercises. Sitting with your leg straight in front, wrap a towel or resistance band around the center of your foot. Gently pull towards yourself while keeping the leg straight until you reach maximum stretch and hold..
As mentioned previously, an ankle brace may be recommended to supplement your recovery from injury. Depending on the seriousness of the injury and stage of your recovery, there are a few alternatives you can consider. Even if you are in the late stages of rehabilitation and have fully returned to activity, it's always worth considering preventative measures to decrease the risk of re-injury. Even something that seems as stable and simple as running could potentially benefit from protective measures, especially when first returning to training. Rigid braces, as the name suggests offer some limited movement. Usually, they enable the ankle to move up and down with lateral movement restricted to protect the injury and possible rolling of the ankle. These are of great assistance to continuing recovery and combine well with a good rehabilitation program, allowing the individual to gradually get back to daily activity in a more mobile and flexible manner while offer great protection to the injured area. The Active Ankle T1 brace and with a little more freedom, the Zamst A-2DX as worn by Steph Curry as both great options when it comes to rigid ankle braces. The lace-up or sleeve brace offers almost unlimited movement and is fantastic for those who have almost fully recovered from injury or who are seeking to protect against possible injury or recurrence on an ankle problem. This style of brace also has the flexibility to allow it to be loosened or tightened to fit both comfort and level of protection. A lace-up brace can often be used with great success when treating a mild to moderate lateral strain, restricting movement enough to allow the injury to heal, yet not inhibiting the wearers usual daily routine or comfort. The Breg lace-up ankle brace represents a great choice in this category. If you are troubled by plantar fasciitis then the main remedy you need to focus on is resting that injury. This can be quite difficult on a daily basis as we lead busy lives. At night too, especially if you have a tendency to toss and turn, you need to try and keep the foot as comfortable and well positioned as possible. A specialized plantar fasciitis splint can work wonders in helping you keep your injured foot immobilized, ensuring a more speedy recovery. In this instance the Mars Wellness plantar fasciitis posterior night splint does a fantastic job allowing maximum recovery and comfort as you sleep. From our analysis, it is clear to see that in terms of basketball, absolutely, the ankle represents a key focal point in terms of injuries sustained. Indeed, not only in basketball but every sport and life in general has to deal with troublesome ankle injuries on a regular basis. The ankle is a highly complex joint which needs precision care. What we can note however is that the correct treatment systems are in place, with a fantastic array of medically superb accessories to help you choose and implement the best possible treatment in overcoming you ankle troubles and get you back on your feet in no time whether you are a professional baller or an armchair fan.